Jason Brubaker is an artist who works at Dreamworks Animation in Visual Development. At night, he uses his free time to draw comics and has since published three books. Two are comic books, reMIND Vol 1 (which I've reviewed) and Vol 2. The third book's the one I'm reviewing today. Before I talk about the book, I want to talk about a particular page on his website. That's the page I always share with my friends whenever they say they want to self publish their comic, sketchbook or artbook. On that page are articles written by Brubaker on his experience in creating a comic online and in book form, self publishing, marketing, selling and making money, all from the perspective as an independent artist. The content he shares is incredibly informative and insightful. There are other artists who have successfully self published and made money from their comics either from books or online comics. What I've noticed is their path to success always follow a similar pattern. However, those artists don't talk about their strategies unlike Brubaker. This is a book from an artist who has been in the trenches. He still has hundreds of copies of his first comic that were unsold lying around at home. From there, he started experimenting by trial and error different strategies to create and market his comics. This book collects the articles from his website. He shares lots of tips, strategies, mistakes and ideas. Brubaker shares generously, holding nothing back. That's the reason why I bought the book immediately after seeing his name and the book's title. I only discovered his book three days ago, bought the Kindle edition and just finished reading it today. A paperback edition is available but I recommend the Kindle edition because it's cheaper, and if you have Amazon Prime it is free. Even if you have read the articles on his website, it's still worth a purchase because Brubaker has added more information and the text is re-written in a more coherent reading order. 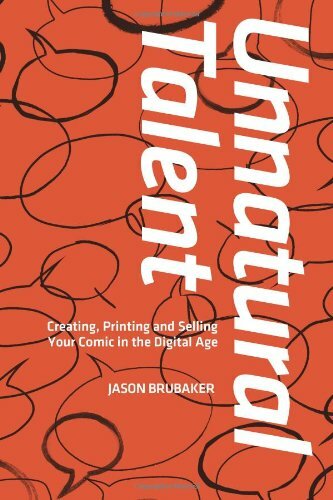 It's essential reading for all comic artists and those who want to self publish. For the price of a book, you can now learn what he spent years and money to learn. It's an invaluable resource.